In case you are just tuning in, I will be running through a 5 stick set of blind cigars that Brooks over at Smokingstogie sent my way. If you haven’t checked out this guy’s site before then shame on you. Amazing reviews, honesty, and photography of some of the rarest and most expensive cigars ever produced. Today I will be lighting up the second cigar in this set. Needless to say with a selection like his, I can’t help but get all giggly each time I find the spare time to fire up one the cigars he sent over. 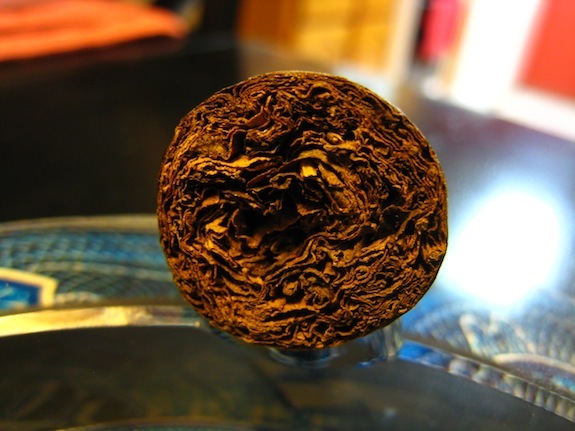 Prelight: #2 is wrapped in a very, very, very dark brown, almost black tobacco leaf. The leaf itself is pretty consistent in color with just a few darker spots especially concentrated around the head of the cigar. The wrapper seems pretty thick and gives off an almost duct tape type gleam as light shines off of its silky, oily texture. The wrapper is excellently laid and tapers off to a very large, beefy torpedo shaped cap. 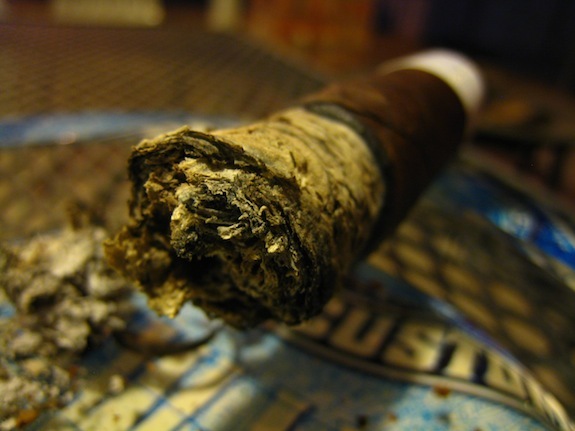 The cigar is firm for the most part, but there are a few softer areas dead center of the cigar’s body. I can’t pick up too much other than a really musky cedar smell coming from the wrapper as the foot of the cigar gives off the slightest hint of spice. Not much aroma coming off this unlit cigar what so ever. The cap clipped clean off (although a little flaky) using my double bladed Palio cutter. The cold draw surprisingly kicked out a massive burst of what could be best described as a spicy gingerbread. Maybe it’s a little too close to Christmas for me., but I swear that’s all I’m getting off this cold draw. First Smoke: The cigar didn’t start off with the massive kick of spice I was expecting. It’s not to say the spice wasn’t there, it just wasn’t in the action packed form I thought it would be. Outside of the subtle spice/pepper the cigar packed a vibrant, woodsy taste, backed by a bit of leather and even some of that gingerbread flavor I picked up during the cold draw. The pepper is kind of interesting though. It’s not too noticeable in taste, but my lips and back of the throat are really feeling it. This cigar kicks out just an overly massive, effortless cloud of thick, grey smoke with every draw. Tons of stationary smoke as well. The burnline was all over the place at first but finally into the second third it began correcting itself. The ash left behind was very flaky, and medium gray with dark black spots and only held on for a little over half an inch before falling into my ashtray. Halfway There: Early into the second third and I am already starting to feel the body in this cigar. One interesting note on my last blind review was the fact that I felt a bit of a full body experience, yet knowing that the cigar is now, I know it’s a mild/medium stick. Maybe I am not the best judge in body, or maybe this just goes to show that my theory is true. The strength of each cigar will always affect each smoker in different ways. Anywho, back to the review. The pepper and spice in this cigar is still just a tease. They’re not as potent as they were to begin with but they still sine through the cocoa, leather, woodsy flavors that have started to develop in the second third. The retrohale is killer, priming my nasal passage with a ton of pepper and cedar. 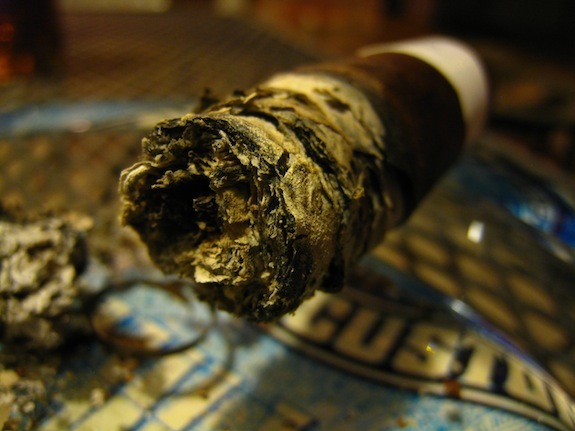 The burnline is still a bit wild on one side of the cigar, but nothing to cause any concern. The ash has also taken a turn for the better with the body being much more smooth, compact and a consistent brownish-gray. Finish: This cigar is really packing a punch. Into the final third and I am really getting a nice little nic-kick off of this one. The pepper has finally started to wear off and now the main flavors are a really smooth woodsy flavor, backed by a bit of earth tones, cocoa, and spice. I am also getting just a bit of harshness as I get to the mid-point of the final third. It’s a bit bitter, but could be worse. The burnline has been consistently wavy leading me to think there might be a bit of ligero thrown into the mix. No touch ups or relights leading up to about an hour and a half total burn. Overview: This was a great little cigar. 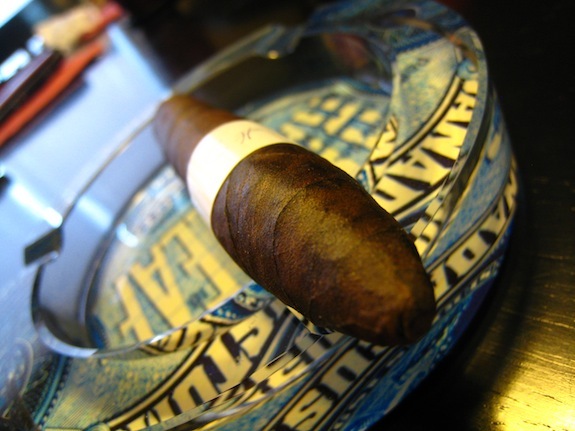 The full body and very powerful flavors made for a great departure from your everyday, smoother, milder maduro. Outside of the harsh bitterness that crept into the final third, this cigar was very enjoyable. It’s probably not something I would smoke everyday, but it’s the perfect cigar to keep on hand when you are out back, enjoying some late night coffee and relaxation. Final Guess? I would have to say something Nicaraguan. Maybe the Oliva Serie V Maduro or the Alec Bradley Tempus. 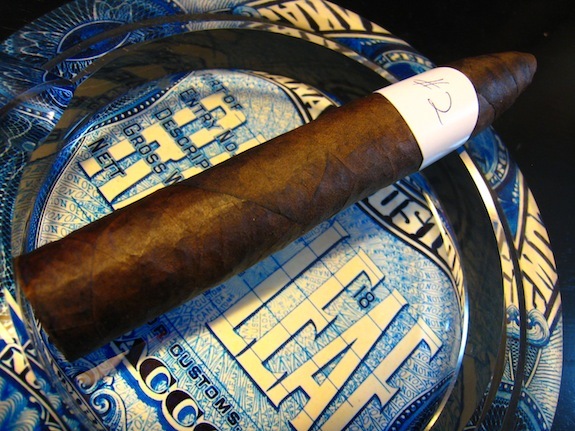 Whatever it is, it’s a spicy little cigar that boasts tons of body and excellent flavors. Very awesome. I would have never in a million years been able to guess this one. What a pleasant surprise. One a side note, Brooks had mentioned that there was a cigar in the bunch that was the only cigar that had ever mad him vomit. This was the cigar. He went on to explain hotboxing and smoking too fast was probably the main culprit. But that’s something to keep in mind if you ever do stumble across one of these cigars. 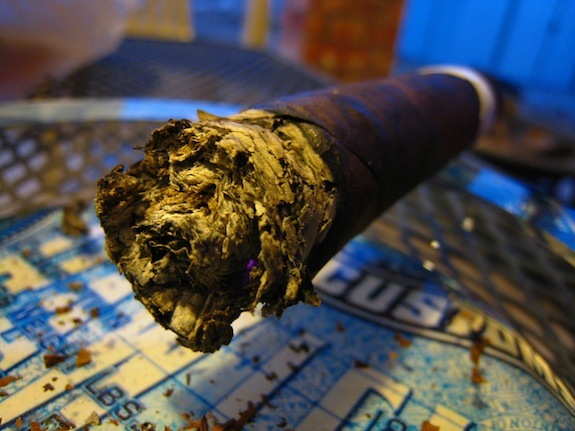 That is an oily looking cigar. Oily+LFD= yummay. Nice looking cigar. Thanks for the review! @boomer – That’s a flawless equation you got going there! Tony I really enjoy the blind taste test really shows what we think we know when we don’t have the answer in front of us. Awesome keep it up pal. Wow. Very good review. Now my appetite is whetted to try one of these myself. As much as I love LFDs, especially double ligeros, this sounds intriguing. By the way, the only AB Tempus I’ve ever smoked and enjoyed was the Genesis (corona size). Keep doing your thing bro! LFD are nice cigars for sure.I find them too peppery for my personal taste. And that was one of the screwballs that went along with this cigar. The pepper wasn’t there in full force as I expected. Just enough to play with me. I haven’t had many LFD’s but I’m with blane here, not a pepper fan. But the way Tony describes it here as being nicely balanced in the mix is something I’d be more then willing to try. My thanks to you for yet another great review, and my thanks to Brooks for being crazy enough to send you a cigar that made him vomit. I actually LOL’d when I read that part.